The potential for sun outages is coming. Twice a year, all television customers all across the U.S. may experience some degree of TV interference due to sun outages. 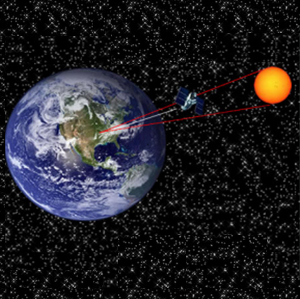 This spring, the solar interference is expected between Feb. 26-March 8, 8 a.m. to 3 p.m.
During the spring and fall for about two weeks, the angle of the sun falls directly behind communication satellites that send TV signals to antennas here on earth. This means that the antennas, while looking for the signals, get blasted with sun at the same time. The sun interference overrides the signals causing outages. The effects of a sun outage vary in degree from minimal disruption to total outage throughout the 15 days. At first, the effects of a sun outage are minimal. But they can gradually worsen to the point of total outage where your TV picture is heavily tiled or macro-blocked before and after peak times. Sun outages typically last up to 15 minutes a day as the sun hits that “sweet spot” in the sky to cause the interference. Once the trouble reaches its peak, it will gradually decrease, becoming less noticeable each day after. Unfortunately, there is technically nothing TDS can do to prevent sun outages from occurring. Each satellite service that we receive signals from will experience this interference in the time frame mentioned above. Just another part of being a modern-day Earthling!